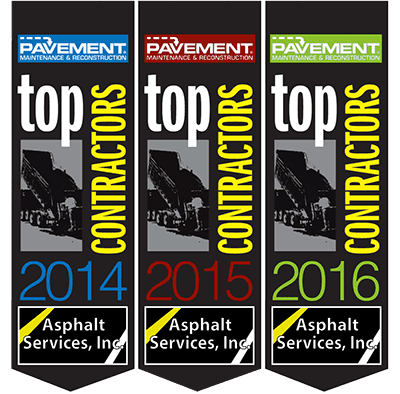 Asphalt Services, Inc. is a family owned and operated business that has been providing commercial paving and residential paving services for over 30 years. We have grown into the region’s most versatile and successful full service paving and site work operation. We take a tremendous amount of pride in our work, our clients, and our employees. Our goal is to provide prompt quality workmanship, and create an aesthetically pleasing result that will last for years to come. We have a full professional staff that is always there to help with any of your questions. Let one of our experienced on-site estimators come to your home or business to provide you with a free no obligation quote, along with all paving, asphalt, and striping info, and preventative maintenance recommendations. We also provide “Lunch and Learn” seminars, providing your entire staff with free lunch and an educational presentation on our services. Call us today to learn more. 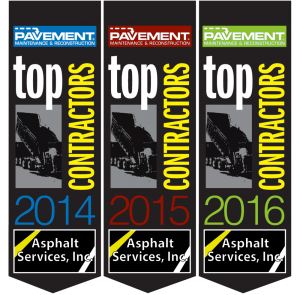 Asphalt Services, Inc. is proud to have been named a national top contractor for Paving, Pavement Repair, Sealcoating and Striping categories by the Pavement Maintenance and Reconstruction Magazine for the third year in a row. It is a tremendous honor to be recognized for all the hard work we put in. We thank every single one of our customers and will continue to offer you excellent asphalt paving, sealcoating, asphalt repair and striping services for many years to come.